Despite the common perception that traditional television is long past its glory days, the average American adult still spends a huge chunk of his or her life watching live television — specifically, over four and a half hours a day, according to a new Nielsen report. 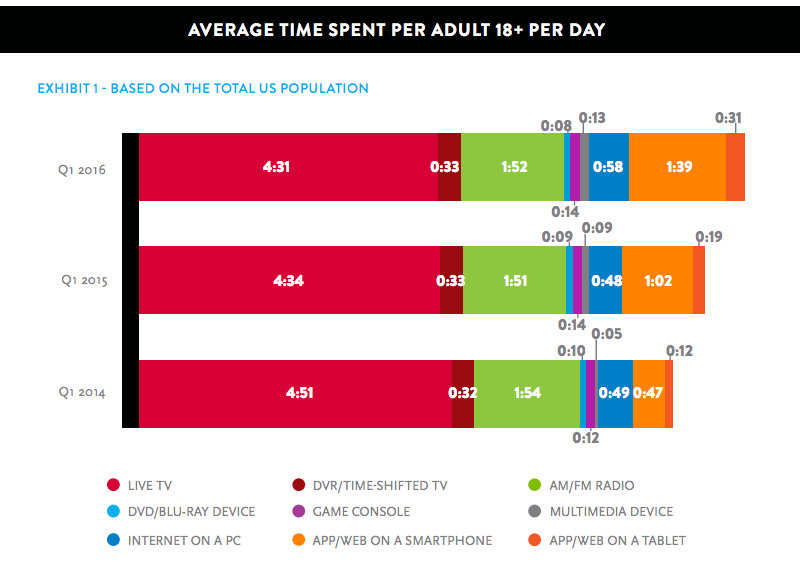 When you add DVR-watching time to this figure, the report shows that the average American adult watches over five hours of TV per day. The study also breaks down weekly time and finds that the average person watches nearly 32 hours of TV (live and DVR) per week. Or, nearly enough for a whole week of work at a full-time job. Though live TV numbers have been slowly trending downward since the first quarter of 2014, total media consumption has increased significantly since last year, as the graph below shows. 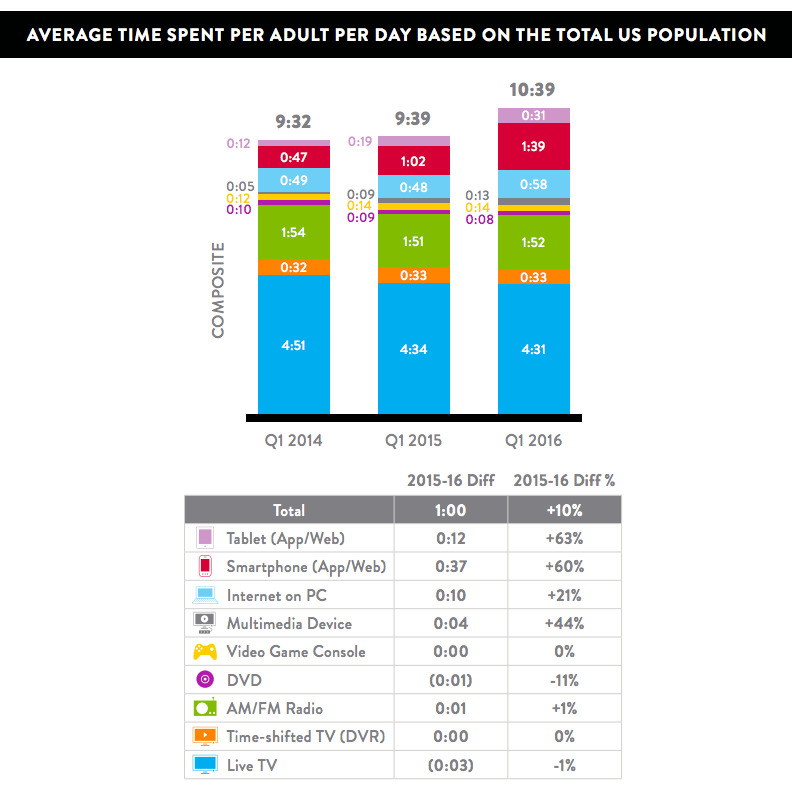 The table above demonstrates how the average time spent on tablets and smartphones has increased approximately 63% and 60%, respectively, since last year. So, while live TV watching has steadily decreased (-1% between 2015 and 2016), the huge spike in media consumed on these newer platforms suggests that total media consumption will continue to steadily increase over the years, especially as streaming services continue to debut more original content that can only be viewed on new media. Speaking of streaming services, 2016 is the first year that subscriptions to streaming services like Hulu and Netflix have equaled the number of subscriptions to DVR services, as demonstrated in the chart below (wherein streaming services are labelled as Subscription Video on Demand or SVOD). Despite all the technological advances of the past few decades, the medium with the most users reached in 2016 was still radio, with 240 million. 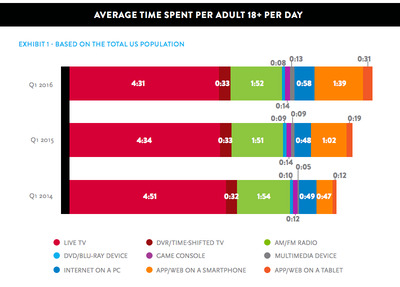 Live television was a distant second with 226 million users reached, followed by smartphones with 191 million. 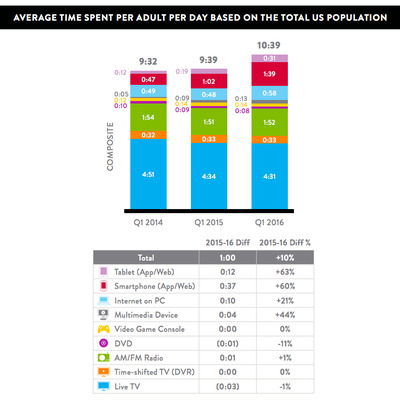 You can read the entire Nielsen study, “Total Audience Report: Q1 2016,” by downloading it here.